World-class is an over-used term in football and maybe it has been with Paul Pogba but there is no doubt that Manchester United have at least one player worthy of that status as goalkeeper David De Gea again demonstrated his incredible importance as he kept his team in this Champions League tie. Two superb saves from headers, the second simply breathtaking, at the end of the first half denied Sevilla who had countless other opportunities against an at-times shambolic United side who nevertheless go into the second leg of this last-16 encounter on March 13 as favourites to progress into the quarter-finals. Manager Jose Mourinho, who dropped Pogba, only to have to bring him on early into this match through injury to Ander Herrera, will have been a relieved man for however it is dressed up this was a far better result than performance from United. They were never in control and did not deserve to come away with a draw. Their debt to De Gea, who even seemed to get into the heads of Sevilla's players, forcing them to try almost too hard to beat him, was simply huge. His reflex save to deny Luis Muriel just before the break was the stand-out moment of the night. "They had the best chances of the game and played really well but the result is open and we go to play the second leg at Old Trafford," the Spanish goalkeeper said. "It was the last minute of the first half so my save was at an important moment of the game. I'm happy for that." Remarkably the least impressed observer was De Gea's manager. "One amazing save and then nothing more to do," was Mourinho's assessment of De Gea's night's work. "All the shots they had were easy shots, simple shots, statistic shots." United's other 'big' player, Alexis Sanchez, was substituted after a frustrating evening for him. Pogba's demotion lasted less than 18 minutes. Herrera, recalled after being ruled out through injury, pulled up sharply holding a hamstring as he chased the ball down inside the Sevilla area. The midfielder immediately signalled to the bench and Mourinho turned to Pogba. He had no other choice. If he had not put the Frenchman on then it really would have constituted a crisis for the player. It also begged the question as to whether Herrera had been risked given his three-week absence. 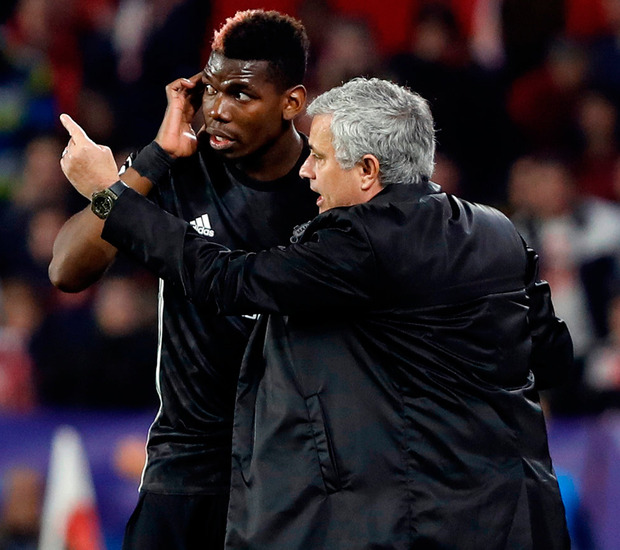 Mourinho had said it would be "unfair" to load Pogba with more responsibility, by focusing on him as the man to drive United deep into the competition, but he loaded that pressure even more by dropping him. By bringing him on so early, though, it nailed any suggestions that Pogba might still be feeling the effects of the illness that meant he missed United's FA Cup tie last weekend away to Huddersfield Town. Now he had to play the role Mourinho demanded from him, could he do it against a Sevilla side who clearly wanted to gain an early advantage over their opponents? They had attacked from the off with a low shot from striker Luis Muriel almost deceiving De Gea who appeared to react late before diving to his right to palm away. The goalkeeper was then sent sprawling in the same direction by another low shot, this time by Jesus Navas, which skidded past a post. But United did well to hold them off, or at least reduce them to shots from distance, amid the relentless, rhythmic support of the Sevilla fans. Dropping Pogba was a very Mourinho-like decision. No one can accuse him of not having the cojones to leave out a big name in what was United's return to the knockout stages of the Champions League for only the second time since Alex Ferguson retired, and with Mourinho in an environment where he first announced himself to the world. And, maybe, Mourinho should have been celebrating an early goal, as Alexis Sanchez picked out Romelu Lukaku who had time and space but skied his volley high over the crossbar. It meant that as the mid-point of the first half was reached, and despite Sevilla's positive intent, it had been the best opportunity although that soon changed. At the other end, Joaquin Correa jinked in from the right only to shoot weakly at De Gea and more chances, better chances, followed. Sevilla, fifth in La Liga, but in the final of the Copa del Rey, with a fine cup pedigree at home and in Europe, once more began to build momentum. United became unsettled, the ball was turned over quickly and fouls conceded, and from one such moment the ball was again ferried to Correa who tried to bend his shot around De Gea. The goalkeeper held it. If anything the noise levels climbed even further and did so again as from another corner he had to tip over Steven Nzonzi's goalbound header. If that was a good save then it was eclipsed when De Gea brilliantly turned away another header, by the unmarked Muriel, from close range. The striker held his face in disbelief. And the half-time whistle blew. United will have been relieved to have reached that point of the match without conceding. So good was De Gea's last save that two Sevilla players - Muriel and Gabriel Mercado - shook his hand as they walked down the tunnel. Muriel still looked stunned. United needed to liven up. They had had one shot on target, a first-time effort by Scott McTominay, that was pushed away by goalkeeper Sergio Rico but were overwhelmed at times. And so Sevilla continued to push with Muriel, maybe unnerved by De Gea's brilliance, slashing a shot over when well-placed and Franco Vazquez doing well but then curling an effort beyond the angle of post and crossbar. Once more space opened up for Muriel as United floundered, failing to gain any kind of control, but he snatched at it, dragging the ball wide before Clement Lenglet headed weakly from a free-kick with De Gea again saving. The defender should have done better. As should Correa who, after a strong run, slipped as he shot with the ball sailing over. Still the chances came with Muriel crossing for Correa at the far post but he attempted to put too much power on his header - again mindful of De Gea - and also sent it over. For United, substitute Marcus Rashford shot wide, Lukaku had an effort correctly ruled out for handball, but it was the home side who remained the more threatening. But they simply could not find the breakthrough; they just could not beat De Gea as United escaped with a draw and a clean sheet.